Bipolar, or manic-depressive disorder, is a mood disorder that causes radical emotional changes and mood swings, from manic highs to depressive lows. The majority of bipolar individuals experience alternating episodes of mania and depression. The Diagnostic and Statistical Manual of Mental Disorders, fourth edition ( DSM-IV ), the diagnostic standard for mental health professionals in the United States, defines four separate categories of bipolar disorder: bipolar I, bipolar II, cyclothymia, and bipolar not-otherwise-specified (NOS). Bipolar I disorder is characterized by manic episodes, the "high" of the manic-depressive cycle. A person with bipolar disorder experiencing mania often has feelings of self-importance, elation, talkativeness, increased sociability, and a desire to embark on goal-oriented activities, coupled with the characteristics of irritability, impatience, impulsiveness, hyperactivity, and a decreased need for sleep . Usually this manic period is followed by a period of depression, although a few bipolar I individuals may not experience a major depressive episode. Mixed states, where both manic or hypomanic symptoms and depressive symptoms occur at the same time, also occur frequently with bipolar I patients (for example, depression with the racing thoughts of mania). Also, dysphoric mania is common (mania characterized by anger and irritability). Bipolar II disorder is characterized by major depressive episodes alternating with episodes of hypomania, a milder form of mania. Bipolar depression may be difficult to distinguish from a unipolar major depressive episode. Patients with bipolar depression tend to have extremely low energy, retarded mental and physical processes, and more profound fatigue (for example, hypersomnia, a sleep disorder marked by a need for excessive sleep or sleepiness when awake) than unipolar depressives. Cyclothymia refers to the cycling of hypomanic episodes with depression that does not reach major depressive proportions. One third of patients with cyclothymia develop bipolar I or II disorder later in life. A phenomenon known as rapid cycling occurs in up to 20 percent of bipolar I and II patients. In rapid cycling, manic and depressive episodes must alternate frequently, at least four times in 12 months, to meet the diagnostic definition. In some cases of "ultra-rapid cycling" the patient may bounce between manic and depressive states several times within a 24-hour period. This condition is very hard to distinguish from mixed states. Bipolar NOS is a category for bipolar states that do not clearly fit into the bipolar I, II, or cyclothymia diagnoses. According to the American Academy of Child and Adolescent Psychiatry, up to one third of American children and adolescents diagnosed with depression develop early onset bipolar disorder. The average age of onset of bipolar disorder is from adolescence through the early twenties. However, because of the complexity of the disorder, a correct diagnosis can be delayed for several years or more. In a survey of bipolar patients conducted by the National Depressive and Manic Depressive Association (MDMDA), one half of respondents reported visiting three or more professionals before receiving a correct diagnosis, and over one third reported waiting ten years or more before they were correctly diagnosed. The cause of bipolar disorder had not as of 2004 been clearly defined. Because two thirds of bipolar patients have a family history of affective or emotional disorders, researchers have searched for a genetic link to the disorder. Several studies have uncovered a number of possible genetic connections to the predisposition for bipolar disorder. A 2003 study found that schizophrenia and bipolar disorder could have similar genetic causes that arise from certain problems with genes associated with myelin development in the central nervous system. (Myelin is a white, fat-like substance that forms a sheath around nerve fibers.) Another possible biological cause under investigation is the presence of an excessive calcium build-up in the cells of bipolar patients. Dopamine and other neurochemical transmitters appear to be implicated in bipolar disorder, and these are under investigation as well. Over one-half of patients diagnosed with bipolar disorder have a history of substance abuse, which may be an issue in adolescent patients. There is a high rate of association between cocaine abuse and bipolar disorder. Some studies have shown up to 30 percent of abusers meet the criteria for bipolar disorder. The emotional and physical highs and lows of cocaine use correspond to the manic depression of the bipolar patient, making the disorder difficult to diagnose. Symptoms of bipolar depressive episodes include low energy levels, feelings of despair, difficulty concentrating, extreme fatigue, and psychomotor retardation (slowed mental and physical capabilities). Manic episodes are characterized by feelings of euphoria, lack of inhibitions, racing thoughts, diminished need for sleep, talkativeness, risk taking, and irritability. In extreme cases, mania can induce hallucinations and other psychotic symptoms such as grandiose delusions. When symptoms of bipolar disorder are present, a child should be taken to a qualified medical healthcare professional as soon as possible for evaluation. If a child or teen diagnosed with bipolar disorder reveals at any time that they have had recent thoughts of self-injury or suicide , or if they demonstrate behavior that compromises their safety or the safety of others, professional assistance from a mental healthcare provider or care facility should be sought immediately. Bipolar disorder usually is diagnosed and treated by a psychiatrist and/or a psychologist. In addition to an interview with the child and her parents, several clinical inventories or scales may be used to assess the patient's mental status and determine the presence of bipolar symptoms. These include the Children's Global Assessment Scale (C-GAS), General Behavior Inventory (GBI), Beck Depression Inventory (BDI), Minnesota Multiphasic Personality Inventory Adolescent (MMPI-A), the Youth Inventory (YI-4), and the Young Mania Rating Scale (YMRS). The tests are verbal and/or written and are administered in both hospital and outpatient settings. Bipolar symptoms often present differently in children and adolescents. Manic episodes in these age groups are typically characterized by more psychotic features than in adults, which may lead to a misdiagnosis of schizophrenia. Children and adolescents also tend to demonstrate irritability and aggressiveness instead of the elation of mania in adults. Further, symptoms tend to be chronic, or ongoing, rather than acute, or episodic. Bipolar children are easily distracted, impulsive, and hyperactive, which can lead to a misdiagnosis of attention deficit hyperactivity disorder (ADHD). Their aggression can lead to violence, which may be misdiagnosed as a conduct disorder . Psychologists and psychiatrists typically use the criteria listed in the Diagnostic and Statistical Manual of Mental Disorders, fourth edition ( DSM-IV ) as a guideline for diagnosis of bipolar disorder and other mental illnesses. DSM-IV describes a manic episode as an abnormally elevated or irritable mood lasting a period of at least one week that is distinguished by at least three of the mania symptoms: inflated self-esteem , decreased need for sleep, talkativeness, racing thoughts, distractibility, increase in goal-directed activity, or excessive involvement in pleasurable activities that have a high potential for painful consequences. If the mood of the patient is irritable and not elevated, four of the symptoms are required. Although many clinicians find the criteria too rigid, a hypomanic diagnosis requires a duration of at least four days with at least three of the symptoms indicated for manic episodes (four if mood is irritable and not elevated). DSM-IV notes that unlike manic episodes, hypomanic episodes do not cause a marked impairment in social or occupational functioning, do not require hospitalization , and do not have psychotic features. In addition, because hypomanic episodes are characterized by high energy and goal-directed activities and often result in a positive outcome or are perceived in a positive manner by the patient, bipolar II disorder can go undiagnosed. Substance abuse can mask or mimic the presence of bipolar disorder and can make diagnosis more difficult in adolescents. When substance abuse or addiction is present, a patient must ordinarily undergo a period of detoxification and abstinence before a mood disorder can be accurately diagnosed. The manic and depressive symptoms of bipolar disorder are usually controlled by a combination of prescription medications, including lithium, antipsychotics, anticonvulsants, and antidepressants . Lithium (Cibalith-S, Eskalith, Lithane, Lithobid, Lithonate, Lithotabs) is one of the oldest and most frequently prescribed drugs available for the treatment of adult bipolar mania and depression. Because the drug takes four to ten days to reach a therapeutic level in the bloodstream, it sometimes is prescribed in conjunction with neuroleptics and/or benzodiazepines to provide more immediate relief of a manic episode. Lithium also has been shown to be effective in regulating bipolar depression, but is not recommended for mixed mania. Lithium may not be an effective long-term treatment option for rapid cyclers, who typically develop a tolerance for it, or may not respond to it. Possible side effects of the drug include weight gain, thirst, nausea , and hand tremors. Prolonged lithium use also may cause hyperthyroidism . Clozapine (Clozaril) is an atypical antipsychotic medication used to control manic episodes in adult patients who have not responded to typical mood stabilizing agents. The drug has also been a useful prophylactic, or preventative treatment, in some bipolar patients. Common side effects of clozapine include tachycardia (rapid heart rate), hypotension, constipation , and weight gain. Agranulocytosis, a potentially serious but reversible condition in which the white blood cells that typically fight infection in the body are destroyed, is a possible side effect of clozapine. Patients treated with the drug should undergo weekly blood tests to monitor white blood cell counts. Risperidone (Risperdal) is another atypical antipsychotic that has been successful in controlling mania in several clinical trials when low doses were administered. The side effects of risperidone are mild compared to many other antipsychotics (constipation, coughing, diarrhea , dry mouth, headache , heartburn, increased length of sleep and dream activity, nausea, runny nose, sore throat , fatigue, and weight gain). Olanzapine (Zyprexa) was approved in 2003 for use in combination with lithium or valproate for treatment of acute manic episodes associated with bipolar disorder. In 2004 it received additional approval for long-term maintenance of bipolar disorder. Possible side effects include drowsiness, dizziness , weight gain, dry mouth, rapid heartbeat, nausea, and muscle weakness. Quetiapine (Seroquel) was approved by the FDA in 2004 for the treatment of acute mania associated with bipolar disorder. Potential side effects of the drug include dizziness, sleepiness, dry mouth, weight gain, and constipation. Ziprasidone (Geodon) is a schizophrenia drug that is often prescribed to treat bipolar mania. Common side effects associated with ziprasidone include dizziness, fatigue, constipation, and rash. Unlike the other antipsychotic drugs, however, it does not promote weight gain. Atypical antipsychotics have been associated with hyperglycemia (high blood sugar) and diabetes in some patients. Their use may be contraindicated (i.e., not recommended) in children and teens with type 1 or type 2 diabetes. Valproate (divalproex sodium, or Depakote; valproic acid, or Depakene) is one of the few drugs available that has been proven effective in treating rapid cycling bipolar and mixed states patients. It is also approved for the treatment of mania. Valproate is prescribed alone or in combination with carbamazepine and/or lithium. Stomach cramps, indigestion, diarrhea, hair loss, appetite loss, nausea, and unusual weight loss or gain are some of the common side effects of valproate. A 2003 study found that the risk of suicide from death is about two and one half times higher in people with bipolar disorder taking divalproex than those taking lithium. Gabapentin (Neurontin) has been prescribed by some physicians for the treatment of bipolar disorder, although there is no conclusive clinical evidence as to its effectiveness. Carbamazepine (Tegretol, Atretol) is an anticonvulsant drug usually prescribed in conjunction with other mood stabilizing agents. The drug often is used to treat bipolar patients who have not responded well to lithium therapy. Blurred vision and abnormal eye movement are two possible side effects of carbamazepine therapy. Clinical trials continue as of 2004 in an attempt to obtain FDA approval of carbamazepine for use in bipolar treatment. Lamotrigine (Lamictal, or LTG), an anticonvulsant medication, is often used in patients with a history of rapid cycling and antidepressant-induced mania. A University of Cincinnati one-year study of the drug in patients with bipolar I disorder found that it provided sustained relief of depressive symptoms. Lamotrigine may be used in conjunction with divalproex (divalproate) and/or lithium. Possible side effects of lamotrigine include skin rash, dizziness, drowsiness, headache, nausea, and vomiting . Because antidepressants may stimulate manic episodes in some bipolar children and teens, their use is typically short-term. Some researchers have hypothesized that the use of antidepressants for depression may even trigger bipolar disorder in children who are genetically predisposed. When antidepressants are prescribed for episodes of bipolar depression, they are usually selective serotonin reuptake inhibitors (SSRIs) or, less often, monoamine oxidase inhibitors (MAO inhibitors). Tricyclic antidepressants used to treat unipolar depression may trigger rapid cycling in bipolar patients and are, therefore, not a preferred treatment option for bipolar depression. SSRIs, such as fluoxetine (Prozac), sertraline (Zoloft), and paroxetine (Paxil) regulate depression by regulating levels of serotonin, a neurotransmitter. Anxiety , diarrhea, drowsiness, headache, sweating, nausea, sexual problems, and insomnia are all possible side effects of SSRIs. In 2004, 10 antidepressant drugs (including fluoxetine, sertraline, paroxetine, and bupropion) came under scrutiny when the FDA issued a public health advisory and announced it was requesting the addition of a warning statement in drug labeling that outlined the possibility of worsening depression and increased suicide risk. These developments were the result of several clinical studies that found that some children taking these antidepressants had an increased risk of suicidal thoughts and actions. The FDA announced at the time that the agency would embark on a more extensive analysis of the data from these clinical trials and decide if further regulatory action was necessary. Electroconvulsive therapy (ECT) has a high success rate for treating both unipolar and bipolar depression and mania. However, because of the convenience of drug treatment and the stigma sometimes attached to ECT therapy, ECT usually is employed after all pharmaceutical treatment options have been explored. ECT is given under anesthesia, and patients are given a muscle relaxant medication to prevent convulsions. The treatment consists of a series of electrical pulses that move into the brain through electrodes on the patient's head. Although the exact mechanisms behind the success of ECT therapy are not known, it is believed that this electrical current alters the electrochemical processes of the brain, consequently relieving depression. Headaches, muscle soreness, nausea, and confusion are possible side effects immediately following an ECT procedure. Temporary memory loss has also been reported in ECT patients. In bipolar patients, ECT is often used in conjunction with drug therapy. Calcium channel blockers: Nimodipine (Nimotop, Admon) and verapamil (Calan, Covera, Isoptin), typically used to treat angina and hypotension, have been found effective in a few small studies, for treating rapid cyclers. Calcium channel blockers stop the excess calcium build up in cells that is thought to be a cause of bipolar disorder. They usually are used in conjunction with other drug therapies such as carbamazepine or lithium. Long-acting benzodiazepines: Lorazepam (Ativan), clonazepam (Klonapin), and alprazolam (Xanax) are used for rapid treatment of manic symptoms to calm and sedate patients until mania or hypomania have waned and mood stabilizing agents can take effect. Sedation is a common effect, and clumsiness, lightheadedness, and slurred speech are other possible side effects of benzodiazepines. Neuroleptics: Chlorpromazine (Thorazine) and haloperidol (Haldol) are also used to control mania while a mood stabilizer such as lithium or valproate takes effect. Because the side effects of these drugs can be severe (difficulty in speaking or swallowing, paralysis of the eyes, loss of balance control, muscle spasms , severe restlessness, stiffness of arms and legs, tremors in fingers and hands, twisting movements of body, and weakness of arms and legs), benzodiazepines are generally preferred over neuroleptics. Because bipolar disorder is thought to be biological in nature, therapy and/or counseling is recommended as a companion to, but not a substitute for, pharmaceutical treatment of the disease. Psychotherapy, such as cognitive-behavioral therapy, can be a useful tool in helping patients and their families adjust to the disorder, in encouraging compliance to a medication regimen, and in reducing the risk of suicide. A 2003 report revealed that people on medication for bipolar disorder had better results if they also participated in family-focused therapy. General recommendations include maintaining a calm environment, avoiding overstimulation, getting plenty of rest, regular exercise , and proper diet. Biofeedback may be effective in helping some children and adolescents control symptoms such as irritability, poor self control, racing thoughts, and sleep problems. A diet low in vanadium (a mineral found in meats and other foods) and high in vitamin C may be helpful in reducing depression. Repeated transcranial magnetic stimulation (rTMS) is a new and still experimental treatment for the depressive phase of bipolar disorder. In rTMS, a large magnet is placed on the patient's head and magnetic fields of different frequency are generated to stimulate the left front cortex of the brain. Unlike ECT, rTMS requires no anesthesia and does not induce seizures. 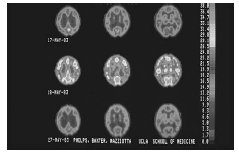 Bipolar disorder shown in a series of positron emission tomography (PET) scans. a complete lack of response to all drug and/or ECT therapy. Drug therapies frequently need adjustment to achieve the maximum benefit for the patient. Bipolar disorder is a chronic recurrent illness in over 90 percent of those afflicted, and one that requires lifelong observation and treatment after diagnosis. Patients with untreated or inadequately treated bipolar disorder have a suicide rate of 15 to 25 percent and a nine-year decrease in life expectancy. With proper treatment, the life expectancy of the bipolar patient will increase by nearly seven years and work productivity increases by 10 years. According to the American Psychiatric Association, bipolar children and adolescents experiencing a manic episode have a one-year recovery rate of 37.1 percent and a relapse rate of 38.3 percent. Discontinuing lithium treatment too early may increase the risk of relapse in adolescents with bipolar disorder. In one 1990 study, 92 percent of adolescents hospitalized for mania who stopped taking the drug experienced a relapse of symptoms within 18 months of discharge, compared to 37 percent of those who stayed on lithium therapy. Children and teens with bipolar disorder are at a greater risk for substance abuse than their non-bipolar peers, and substance abuse can worsen or complicate bipolar treatment. In a 1999 two-year follow-up study of adolescents hospitalized for manic episodes, patients who had ongoing drug or alcohol abuse problems had more manic episodes and poorer functioning than those patients who were not substance abusers. In addition, some studies have indicated that children who develop bipolar disorder in adolescence are more likely to develop a substance abuse problem than those who have early-onset of bipolar disorder in childhood. The ongoing medical management of bipolar disorder is critical for preventing relapse, or recurrence, of manic episodes. Even in carefully controlled treatment programs, bipolar patients may experience recurring episodes of the disorder. Education in the form of psychotherapy or self-help groups is crucial for training bipolar patients and their caregivers to recognize signs of mania and depression and to take an active part in their treatment program. Children with bipolar disorder may require special accommodations in the classroom. Section 504 of the Rehabilitation Act of 1973 enables parents to develop both a Section 504 plan (which describes a child's medical needs) and an individualized education plan (IEP), which describes what special accommodations a child requires to address those needs. The IEP may cover issues such as allowing extra time on tests, modifying assignments, and providing home tutoring or a classroom aide when necessary. Children who are diagnosed with bipolar disorder should be reassured that the condition is due to factors beyond their control (i.e., genetics, neurochemical imbalance) rather than any fault of their own. For those children and teens who feel stigmatized or self-conscious about their diagnosis, arranging psychotherapy sessions outside school hours may lessen their burden. Any child on prescription medication for bipolar disorder should be carefully monitored for any sign of side effects, and these should be reported to their physician when they do occur. A dosage adjustment or medication change may be warranted if side effects are disruptive or potentially dangerous. See also Depressive disorders ; Minnesota Multiphasic Personality Inventory . American Psychiatric Association. Diagnostic and Statistical Manual of Mental Disorders 4th edition, Text Revision (DSM-IV-TR). Washington, DC: American Psychiatric Press Inc., 2000. Papolos, Demitri, and Janice Papolos. The Bipolar Child , 2nd ed. New York: Broadway Books, 2002. American Psychiatric Association. "Practice Guideline for the Treatment of Patients with Bipolar Disorder (Revision)." American Journal of Psychiatry 149, no.4.(April2002):1–50. "Education and Your Bipolar Child." Brown University Child and Adolescent Behavior Letter 20, no. 7 (July 2004): 9. "Lithium and Risk of Suicide." The Lancet (September 20, 2003): 969. "Schizophrenia and Bipolar Disorder Could Have Similar Genetic Causes." Genomics & Genetics Weekly (September 26, 2003): 85. Sherman, Carl. "Bipolar's Clinical, Financial Impact Widely Missed. (Prevalence May Be Greater than Expected)." Clinical Psychiatry News (August 2002): 6. Child and Adolescent Bipolar Foundation (CABF). 1187 Wilmette Ave., PMB #331, Wilmette, IL 60091. Web site: http://www.bpkids.org. Depression and Bipolar Support Alliance (DBSA). 730 N. Franklin St., Suite 501, Chicago, IL 60610. Web site: http://www.dbsalliance.org. National Institute of Mental Health (NIMH) . Office of Communications, 6001 Executive Boulevard, Room 8184, MSC 9663, Bethesda, MD 20892–9663. Web site: http://www.nimh.nih.gov. U.S. Food and Drug Administration. "Antidepressant Use in Children, Adolescents, and Adults." Available online at http://www.fda.gov/cder/drug/antidepressants/default.htm (accessed November 9, 2004). Affective disorder —An emotional disorder involving abnormal highs and/or lows in mood. Now termed mood disorder. Anticonvulsant —Drugs used to prevent convulsions or seizures. They often are prescribed in the treatment of epilepsy. Antipsychotic drug —A class of drugs used to control psychotic symptoms in patients with psychotic disorders such as schizophrenia and delusional disorder. Antipsychotics include risperidone (Risperdal), haloperidol (Haldol), and chlorpromazine (Thorazine). Diagnostic and Statistical Manual of Mental Disorders, Fourth Edition (DSM-IV) —This reference book, published by the American Psychiatric Association, is the diagnostic standard for most mental health professionals in the United States. Hypomania —A milder form of mania that is characteristic of bipolar II disorder. Mania —An elevated or euphoric mood or irritable state that is characteristic of bipolar I disorder. This state is characterized by mental and physical hyperactivity, disorganization of behavior, and inappropriate elevation of mood. Mixed mania —A mental state in which symptoms of both depression and mania occur simultaneously. Also called mixed state. Psychomotor retardation —Slowed mental and physical processes characteristic of a bipolar depressive episode.